The answer: Neuroscientists appear to point to their own history as well to the onset of computational and imaging technology. As was noted in a press conference on brain development, the ground zero thinking starts with the 19th century work of Spanish anatomist Ramon y Cahal who first raised the issue of how should one study the brain? 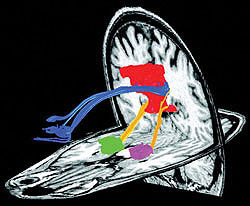 : Whether in terms of localization of brain anatomy and function or exploring the relations throughout brain mass or what we might call, the brain matrix? As James Marshel of UC San Diego pointed out, computational biotechnology has brought Cahal’s early network theory into the 21st century. As this conference makes patently clear, what we have learned about the networks involved in developing and maintaining the human brain and central nervous system has been made possible by way of PET, FMRI, EEG and increasingly more refined circuit reading platforms. For 21st thought leaders and change agents working throughout the world, this news is both exciting and reassuring: With a systems or network approach to mapping brain anatomy and physiology, the levels of interconnectedness between the macro and the micro, between social and digital networks of information flow can now be associated in some manner with networks of brain function.